Digium’s single span digital cards are the latest additions to the Telephony Card family. The latest design utilizes state of the art technologies to support T1/E1/PRI environments that require a high-performance, cost effective digital telephony interface card. They have the ability to create a seamless network, interconnecting traditional telephony systems with Voice over IP technologies. These cards support industry standard telephony protocols, including Primary Rate ISDN (both North American and Euro Standard) protocol families for voice. Both line-side and trunk-side interfaces are supported, as well as advanced call features. 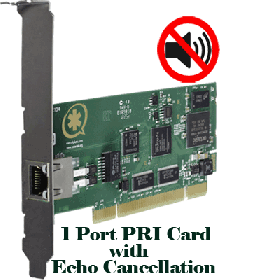 Octasic based hardware echo cancellation is built in to the cards, which removes the task of echo cancellation from the systems CPU and increases overall system performance and call quality.